The SLS Manufacturing Process is an "Additive Manufacturing" process. From Powder, to Prototype, to Production in a Matter of Days! SLS additive manufacturing produces parts layer-by-layer. As each powder layer is sintered, it builds the part one layer at a time. Step 1. 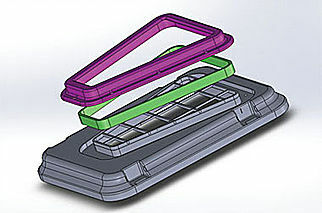 The 3D CAD file is sliced into cross-sections or layers 0.10-0.15mm thick. Step 2. 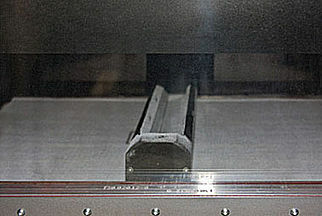 The SLS machine heats the plastic powder close to the melting point. 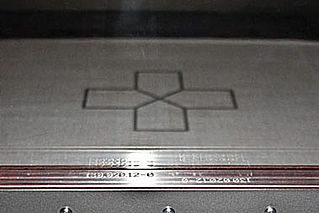 The laser makes a pass over the build platform and selectively melts one cross-section layer. Step 3. The machine lowers the bed of the build chamber and the recoater carries a new layer of material across the build platform and repeats Step 2. Step 4. Our machines build at about 10-15 mm per hour. Step 5. 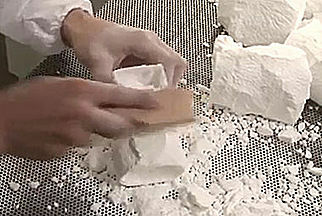 After the powder cools, parts are removed from the “cake” of powder by a technician and each part is bead blasted to remove the excess powder. 3D CAD file. This part would require thousands of slices to be sintered during manufacture. SLS laser sintering the layer. The recoater adding another layer of powder to build the part. SLS printed part in the cleaning process.